Google Video service allows you to upload, share and playback long videos with generous time limit and size. However, this cool free video hosting service is closing very soon. From April 29, 2011 videos uploaded to Google Video will no longer be available for playback. So, it is important that you download your Google videos and upload them best Google Video alternative like Youtube, DailyMotion. Google has added download button on your uploaded videos webpage. You can simply click it to download your uploaded Google videos. Please note, this download button for saving Google videos will be disabled by May 13, 2011. If you do not intend to download your uploaded Google videos, you do not need to do anything and let your Google videos vanish as Google Video service closes down. 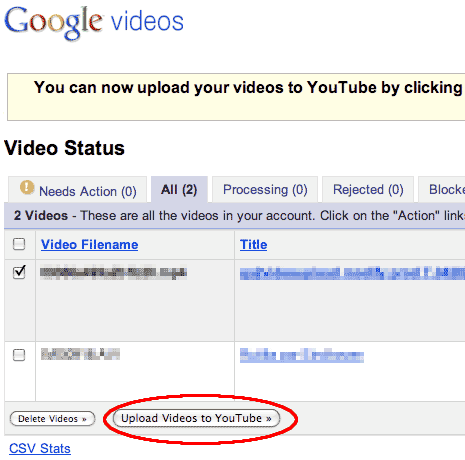 Google has added new option for automatic transfer of existing video in your Google videos account to Youtube account. Just open the video status webpage [google.com/video/upload] and click ‘upload videos to Youtube’ button. As pointed by Youtube blog, make sure videos being migrated confirm to Youtube terms of services. This automatic option will bring your Google videos alive on Youtube. Youtube is best alternative to Google Videos even though it bring limitations of 15min video duration and 2GB video file size. Besides automatic transfer, you can also explore following method of manual download of Google videos and upload to Youtube. Open video status webpage [google.com/video/upload] and login into your Google account. To download a video to your computer, click the Download Video link located on the right side of each of your videos in the Actions column. Once a video has been downloaded, “Already Downloaded” will appear next to the Download Video link. Now you can simply upload downloaded videos to your Youtube account. 1. Goto Youtube.com and login into your account. Then click Upload button and click browse to select video file that you want to upload. 2. As the video file uploads, you can add information about video being uploaded including: Title, Description, Tags, and Category. Click Save changes button and your uploaded video should be available for playback and sharing in quick time. Besides Youtube, you can also explore Dailymotion.com to upload and share your downloaded Google Videos collection.